Uh-oh! Someone’s feelin put out. Humm “A+”. Yous be playing up that teacher vibe. I mean, I come here for the strip, but I check in repeatedly for the community. It’s like another family! And you were supposed to bring a covered dish for the pot luck.. I didn’t have time to make anything so I stopped at the store on the way here and grabbed a bag of chips hope that works. But true, not everyone reads the comments. Which is great, because when you finally reveal who Blind Guy is, you’ll get a barrage of comments, half saying “called it” and half saying “whoa didn’t see that coming.” Also, you’ll probably get a comment or two from me making wild predictions that simply have no place in the story and should never have been imagined. Because I do that. I always chuckle when I read the comments that make it very obvious that despite posting a comment they don’t take the time to read any other comments. And I brought a case of beer and bottle if whisky to the family pot luck, just for the grown up table though. I got plain chips with bacon horseradish dip, zat okay? Well, unfortunately my digitizer broke, so i have no way to share my Dorito nachos with any of you shy of shipping them. I doubt the awesomeness will hold up, but I’m willing to try if you are. At the very least, I can “share” recipes – as if you need one for dorito nachos – I’ve tried some of my mom’s old ones as a tribute to her recently. Sorry, but I hope you mean old recopies instead of old nachos. I just had a vividly scary picture of the underside of a bed with food covered plates and five year old nacho beards. Ellie cracks me up in the last panel. She must be kind of frustrated that her large… eyes… are not effective here. Yes, I am sure she was fantasizing about his hands gently, but firmly caressing her… face. I am curious about her expression in panel 3 though, I dont think I’ve ever seen that one before. It looks like the ‘I am not amused’ face…I just realized something, has something happened to KK? She mentioned Barrel, but…we havent seen KK since the time skip…hope she’s alright. Glad to hear, she’s my favorite ‘non-main’ character, the ultimate big sis lol You never did answer one question about her some time back though I’ve seen asked a few times. Is there anything special/reason she wears ribbons in her hair? The real one wore them. I just realized how bad that monogram joke actually was. Wouldn’t that face be associated with either the “I shoulda had a v8” or a facepalm reaction without the face palm? On an unrelated note, that expression on Ellie in panel 3 is fantastic. Haha, hopefully I don’t become too used to it. And yeah, she’s not looking too pleased at all haha. I’m kind of thinking that she’s not to pleased with herself for some reason. As if her facebook snark time could have been put to an interesting use in real life instead of at her fingertips. Someone who needs ten milligrams of Zolpidem Tartrate. I’m likin’ Blind Guy more and more, and I already like him a lot. And Ellie too, if that’s possible. It’s so enjoyable to watch this fun little dance they’re doing. Either blind-guy is a little oblivious or never really got into the “game” – the latter makes sense with him being blind. But that doesn’t mean he knows that – again, going with teacher assumption – Pumpkin could’ve just said her older sister, no age attached. According to http://shotgunshuffle.com/odds-are description of Ellie, she’s 18. One question: Will there be a party? Okay not kidding here and offering totally constructive commentary (I know, so unlike me) – even a small birthday party sounds like a great chance to get a group of characters together and show some unplanned discussion (unplanned, of course, if a party is not already part of your plan, in which case ignore me!). It might allow you to plant some seeds for future events or revelations, or experiment with introducing characters to each other who you had no intention of ever meeting in the story, just to see how the different personalities mesh or collide. Who knows? You might develop new friendships or adversarial relationships that help fuel new ideas for the story. At the very least, you’d probably have plenty of chances for some good laughs. Not that you aren’t doing a fine job now, just thought I’d call attention to the opportunity. I do understand you may already have most of the story.. um.. storyboarded… and in that case a birthday party might just be nothing but filler in which case, again, ignore me! But if the story is still evolving, and you’re going to fit a birthday in anyway, a party might be a good scene to consider. The story is into autumn now, and Ellie needs a birthday soon. That works! I am one of five children. All of us have late-summer to autumn birthdays. Our parents lived in Minnesota at the time, and I half-jokingly observed that winters must be boring in Minnesota, because we were all born about 9 months after winter. Out of nowhere? Like you were just in the middle of a department store, and your dad blurted out, “Ya know we only had all you kids ’cause we were bored!” But, you know, in a nicer way? Not a department store, but sitting at a dinner table or something like that. And no, he didn’t use the word “only”, but he said something to the effect of “the five kids were all 9 months after winter because Minnesota winter.” Who knows, maybe he was half-joking as well, but I still can’t tell you what prompted it. Heh, welcome to the club. Despite having a fourteen year age spread my brother, sister and I have birthday’s within four days of each other. I’m the lucky one, mine occasionaly falls on Thanksgiving which I always thought was kind of cool, their’s are just tad too late in the month. Heh. I did that math when I was a teenager. I was born 9 months after New Years Eve. My parents had a 4 month old at home that New Years Eve… they had to have gotten righteously sauced. 1) How do you figure the time in the strip is in autumn? Not arguing, just wondering what clue I missed out on. 2) Not trying to tell the author how to create his awesome creation, but I think Ellie has to have a spring birthday. Otherwise, it’s difficult to work out the Juniper timeline. Fair enough, I can certainly understand a time crunch – like I said, I was just taking notice of the opportunity. All I can say is – there’s always flashbacks, and other characters who have birthdays, and the fact that a birthday party isn’t the only place where one could experiment with otherwise-unlikely-because-they-would-never-cross-paths character interaction. Just out of curiosity, is this a pretty racially-homogeneous area of Florida? I come from one of the whitest states in the U.S. and whenever I’m in Florida one of the first things I notice is how many African Americans and Hispanics I encounter day-to-day, but besides Free Cable guy early on in the strip and the adopted Asian nerd everyone here seems to be of the lighter-toned skin type. I’m not accusing you of racism or anything like that, I’m just wondering about your experience living in Florida and maybe trying to probe myself sociologically. The only reason I may have noticed the contrast is because again, I live in a county that’s whiter than Canadian Christmas. There were a variety of different types of people in the year book photos. I am not from Lakeland (where the comic takes place) but Orlando and surrounding areas are usually pretty diverse. This comes mainly because many people move here from other states and other countries. My high school boasted that there were over 32 languages spoken by the student body. I had friends from different countries, religions and races. That is kind of awesome. Considering that we had English, French, Spanish classes, German foreign exchange students, Country Bumpkin, Farmer, Rancher, candlestick maker (not), farmer jock and ozark french. I have some more diverse characters coming up, if you’re worried about everyone being white. Some of them fairly major. But don’t forget Noel and Maria from O’Jacks day crew, and Zane, Quinnn’s ex. You’d be surprised how often Canadian Christmas is not actually white. NO SNOW IN THE GREAT WHITE NORTH? Maybe we could import some from Columbia? No white Xmas doesn’t mean no snow. I live in Boise, Idaho, we get lots of snow in the winter (enough that I have 4 nearby mountains from which to choose to go snowboarding all winter and into early spring), but we don’t often have snow on the ground on Xmas day down in the city. When we do, it’s usually because it snowed a few days before, then most of it melted and mixed into the dirt and oil and garbage and this nasty de-icer stuff they spray on the roads to help people who moved here from warmer climates and never drove on the ice or snow or even wet roads much while growing up and… well it’s really more of a grayish Xmas, with flecks of black. Idaho also, on the right side. I can’t believe that Adrian Veidt just made a coke joke. Exactly, and not very good at dealing with it! This plays off what Ellie told Quinn, right. But it also plays off Quinn not inviting Ellie out with her to the movies in the past. Ellie is ambitiously flirting more to go out and have fun, than to pursue a serious date. I don’t doubt she kinda likes him, but she’s tired of working and sleeping. She’s going stir crazy. And getting tired of playing board games with FatFat because he’s eaten most of the pieces. Except the thimble because no one likes the thimble. I would either be a blissful nerdboy, or just confused as to what to do next. FYI, in Panel 1 ‘opportunity’ is misspelled…other than that, great stuff!!! It’s the only way I can get new commentors. Maybe it’s an unconscious reaction by the author to drag the previous strips cat face smile :3 into a verbal reaction by Blind Guy to unintentionally and unconsciously react to a visual cue that he could only hear in her voice. And for that matter, why is he not picking up the signal- is he uninterested, or is he oblivious? It seems likely that he knows Ellie is Pumpkin’s older sister, and thus he realizes that he played a role in Ellie being booted out into the cold world. He may be worried that she will go nuclear when she realizes exactly who he is. My take on Ellie is that she shouldn’t get too upset when she finds out. *Any* teacher would have a problem with plagiarism, and in the cold light of day she knows she was in the wrong, so she is unlikely (at this point anyway) to push the blame onto him. And on the gripping hand, she is doing okay now, not in danger of homelessness and has some sort of career going. So, ironically, I think stalling is the worst thing he can do at this point; the best thing would be to ask her on some sort of date. (Not seeing a movie I guess, but maybe go to a music concert?) She’s getting annoyed at the stalling. Of course, if she wanted, Ellie could just take her pick from the unattached nerds. They would probably keep fainting though. Wait, this guy is Pumpkin’s teacher? (the hell is that?) I’m not sure why he would feel responsible. If he’s any sort of decent teacher (and his gentle coaching of Ellie would seem to indicate that he is) then he’s not going to have qualms about giving the report the grade it deserved. I spent a while trying to type a coherent reason why a teacher wouldn’t/shouldn’t worry about the consequences of grading fairly so I’ll default to a law enforcement analogy instead. Let’s say a cop gives a drunk driver a ticket for DUI. It could be the last straw that causes the person to lost their liscense, the final “oops” that breaks their marriage, it could be a whole host of things. Is the cop going to feel personally responsible for “ruining” that persons life? They shouldn’t because it’s their job to keep drunks off the road and anything that happens is not a result of the cop ticketing the drunk, it’s a result of the choices made that led them to drive drunk. e.g. Ellie made a choice to hog the computer, she made the choice to Phlegm-Gerize Pumpkin’s paper (poorly I might add) and those choices were the proverbial last straw that got Ellie booted (which sounded like it was already in motion anyway because Ellie’s mother had already discussed it with her father.) If Blind Guy feels responsible for any of it I feel bad for him because that means he’s suffering from Atlas syndrome. And I know from personal experience how unhealthy that can be. Also, where the hell is his dog? The dog, if it’s a real service animal, is laying at Blind Guy’s feet under the table. And the analogy is a good one, but how about this. Why should a doctor throw pearls before swine and tell a patient to loose weight to feel better and get rid of that nagging back pain when they don’t do a damn thing? Got that from [SCRUBS], but still, why should a doc, cop, nurse, feel bad when someone continues to be oblivious to the bad choices that someone makes who crosses their path and does not heed the writing on the wall. My nephews didn’t. Sorry, don’t mean to be bringing that up, but they didn’t. And that’s a real world connection there. There’s nothing wrong (or odd) about doing something you know is right that had unpleasant consequences, be sure you’d do the same thing again if put in the same situation, but still feel bad about the consequences. Imagine being put in a situation where you have to kill someone in self-defense (or defense of loved ones). I suspect he’s aware with Ellie and has some moral qualms about dating an older sister of one of his current students. I think he’s trying to keep her momentarily at arm’s length without pushing her too far to come back to once the school year’s over. But isn’t that only if he knows her last name? And then if he puts two and two together, like if he is a teacher, and a student comes in and sees Ellie and teacher together sitting there talking, and then in class the next day before the teacher gets there, the student let’s loose about the hawt girl that the teacher was talking with, and then Pumpkin and Ashliii walk in as the description is given about the hawt girl in the manager trainee shirt and blonde hair and blue eyes and feminine assets above all. Then some sort of Three Stooges type of interaction with a Monty Python verbilization matrix realizer causes the entirety of the class room to do silly walks while Pumpkin, Ashliii and student just watch as teacher rides into the class on a white hourse followed by taunting frenchmen and one self aware serf who didn’t vote for anyone. And then Pumpkin says that Ellie is managment, and the student says that they kissed, and Ashliii walks into the wall while texting, knocking over a shrubbery onto a pie cart that launches pies into everyone’s face, including the teacher, Mr. Kotter, Mr. Woodman, Charlie Moore, Dr. Samuels, Mr. Schoop and Vice Principle Gills before exploding into little automatic Chaplin and Keeton dolls running all over the place tripping people with canes and violins. He spent a long, irritating conversation with the Knights Who No Longer Say Ni to get that shrubbery so Ashliii wouldn’t break her nose walking into the wall. He’s very thoughtful that way. If I thought that I had a chance with Ellie, I’d just offer my hands, one palm down, one palm up and raised off of the top of the table. I think you may have read too much into it. And I doubt that he’d know that she’d been kicked out of the house unless Pumpkin was telling Ashliii about it. But sometimes 1 + 1 does not add up because it’s not on the radar screen of what needs to be done. By the way, I’m going to go back to the comic where the paper comes into effects. I don’t think he’s socially awkward, per se- his actions indicate that it’s not awkwardness that compels him, but rather a sense of guilt. In his mind, his actions caused her to get kicked out of her house. And as Ellie told him, she got a job she hated, because she was “desperate.” She moved in with a person who treated her like crap, because she was “desperate.” From his point of view (no joke intended), he caused this to happen, so his constant checking on her, unassure of how to proceed is perhaps due to his residual feelings of guilt. But my biggest concern is Ellie. How did she go from thinking “he’s got the feels for me,” to “you just missed your chance”? There seems to be a slight jump in logic. If she thought he was attracted to her, then why did she give up? It’s not like he actually denied any potential attraction. But again, I am somewhat socially incompetent. She’s reacting immaturely to being spurned. Poorly worded mental sparring? She’s really trying to drop the heavy hints, isn’t she? mmm… Ellie is 18 yet. Most people are kinda shallow (it’s a generalization folks!) in that they don’t think things through more than the “here and now” or from anyone else’s perspective. Goes for just having a hang-out friend (as suggested above) as well as relationship. For the other part, I agree with steveha; he’s socially awkward. And that could be due to the situation (I’m a teacher, this is a student’s older sister) or his personality. It could also be he’s stalling (and therefore socially awkward) while he comes up with something to say without alienating Ellie. Imagine getting a pep-talk from someone that helps you turn your life around and you think of the person as a great friend or romantic interest. You make a move, then they turn around and essentialy say “All that bad stuff that happened to you? Yeah, I’m the *reason* it happened.” Not that he’d say that, but that’d what Ellie would most likely hear if BG said anything about being Pumpkin’s teacher without a good lead-in. As a writer, my dialogue is my weakest area right now (yet I’m great at writing charismatic speeches – go figure), and I can’t think of any non-backfire way for that to not blow up in his face when I generalize Ellie down to what a personality profile suggests. I personally think Ellie is better than that – in that, after she blows up at him, she’ll realize it wasn’t as bad as she thought or that he really did cause anything – it was her actions and those of fate / life in general. I enjoy Wall-o-text. Thanks for taking the time to comment so much. So, I totally get why BG is both unable to make a move and unable to pull away and leave (guilt vs. awkwardness). What I don’t get is exactly what Ellie’s asking: If he was hoping to encounter her, why not come in the evenings? Chance of encountering students seems to be the same at either time. If he wants to just be around people, why not order something or come at dinner, when more folks are around? Is it that he intends to stay for her shift, then chickens out when the time rolls around? I’m thinking that the cart is before the horse with this teacher can’t date Ellie relationship because we don’t know everything yet, just going on inferred information from someone and may or may not have been led on by the author in order to continue the speculation of the readers subjugating themselves on the altar of the shipping the characters. And if he does or doesn’t feel bad about it… NO, he can not have known about Ellie being Pumpkin’s sister. They met on her first day there, and he was desparate to talk to someone, which was shown afterwards, and Ashliii doesn’t make mention of the paper until that night, I think. Maybe another day. Unsure. Pumpkin may have mentioned to some of the other students that her sister got kicked out of the house, but that would mean that she’d have to admit that she didn’t write the paper and doesn’t deserve the punishment for phlem-gerizm. I don’t know about you guys, but I think that I’d rather swallow the “I didn’t write this paper thing” and face whatever punishment that I have coming now before I mention that I didn’t write the paper or even copy the stuff. Funny of me to be saying this, ask me. Actually, Ashliii knew that Ellie “wrote” the paper as she brings up the paper incident to Ellie when they meet. So Pumpkin was telling Ashliii—and presumably others—all about it. Since they have that class together and not all classes together, it’s a good bet they were talking within earshot of a man who has to rely on listening for his info. While being blind doesn’t enhance a person’s hearing, they do tend to pick up on things many of us would ignore as it is now their primary sense. The conversation between Ashliii and Pumpkin about Ellie came about because Ash saw Ellie’s name on the schedule for orientation the day before. So he would know where and when she would be at O’Jacks. Also, just because a person SHOULDN’T feel guilty about something doesn’t mean they WON’T feel guilty. Irrational guilt is quite common. Good memory. 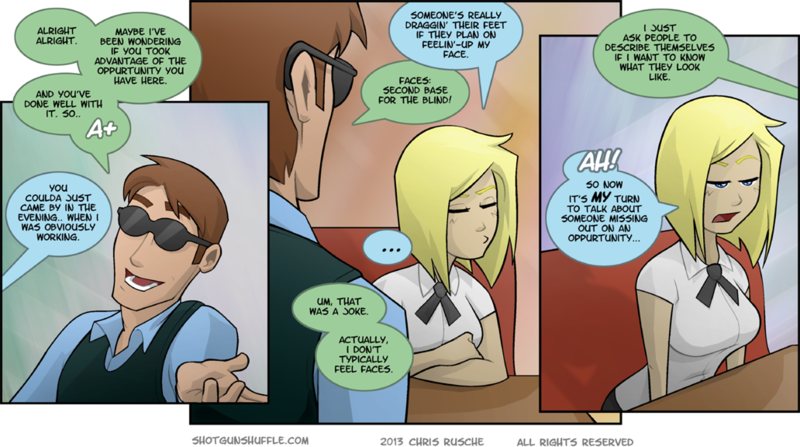 I had to do some archive trawling last comic to find that Ashliii had said she saw Ellie’s name on the roster in a way that could’ve given Blind Guy information before he arrived. Comic was Rage Text as I recall (same one where Ellie first stated they agreed she was the Lazy One), for anyone else wanting to look it up. Yep. “Rage Text” and a comment Rusche made about Blind Guy only knowing Quinn through Ellie’s conversation were the prime clues that allowed me put it all together. Personally, I only know of a few high school teachers who never left the room during breaks. But isn’t that making an assumption that Mr. Stevens never leaves the room? Teachers have to gossip at some time, which could also allow for the possibility that he met Ellie at the restaurant, o damn, you might be right. Anyway, I got the stuff about Mr. Stevens, it’s just that Ellie’s lines perplexed me just a bit. And don’t feel bad about the wall o’ text- it makes me happy that someone cared enough to spend that much time writing to me. So, thanks! Me, I’m so oblivious, Black Holes take notes on the destruction of my dating scenes. Tornadoes quiver in their paths. Hurricanes whistle at me as I walk by. And the earthquakes, great me in the bathroom. Haha! I’m sure you’re not all that bad- after all, I can tell from your comments alone that you’re a fairly intelligent person, and intelligent people can’t be THAT oblivious. Nick, well, the timing on that earth tremor has got to be astronomical, but can you imagine hitting the seat to use the toilet at the same exact time that the P waves hit the same spot, vibrate the toilet and everything connected to it? But, yeah, I’m oblivious as to proper dating techniques and such. Etiquette, not so much. Getting from point A to point Z, blind as a bat. I’m going to suggest on my scale that Blind Guy has a 95% chance of having at least 14 dates with Ellie. Wait, forgot to carry the one. 140 dates with Ellie, getting Married and being the first to die after thirty years of marriage. I think Denise from the FoxTrot comic taught us all that feeling up the face is DEFINITELY “second base for the blind”. BlindGuy can not deny this. We know better. I miss FoxTrot, it was one of my favorite comic strips for a long time. What happened to the coleslaw and the guy who was at the drive thru? Some one whats to be felt up…. Did your supervisor take care of that guy in the drive thru? I’m really getting tired of wondering what the hell happened to that spawn of fast food critters and such.